The Ibalansi farm stables have a real story to tell. When Lara and i first arrived on the farm it was our dream to have our own stables for our ever growing herd. 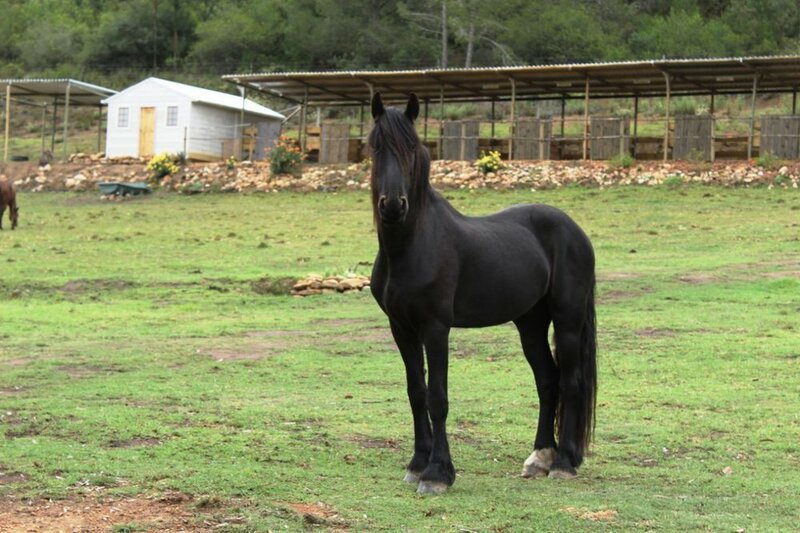 Donna and Sodwana were the first horses to call ibalansi their new home. But what is a horses home without stables for tacking up, grooming, farrier, dentist etc. Adam was up to the challenge. After much time spent getting quotes in Riversdale and been offered way too much for construction, Adam and a registered builder put the plans into motion that they would build it themselves. We had planned for simple open stables where horses could come in and out for food, grooming and other necessities. Within 3 weeks, the poles were in, the roof was taking shape and soon the roof was on and the divisions of stables was complete with spacious 4x3m wide stables, plenty of space and comfort for any of our horses or the establishment of a livery. Little did we know that our construction work was going to be tested by the ruthless building inspector called ‘mother nature’. We check the weather almost daily to see when the next rainfall is due or when is it a sunny day to take the horses to the arena for riding etc. We soon discovered an incredible storm brewing in the Atlantic. First in its warpath was Cape Town. as it drew closer and closer, news started spreading for people to secure their homes, block their windows, park their cars under garages and safe places and to stay away from the ocean front. The storm released all its fury on the cape and it was on its way to us. Within 48 hours we prepared the house and animals as it neared down on Riversdale. a lot of people in the area said the worst of the storm was in Cape Town and that we wouldn’t be affected much…boy were they wrong. Even though we got the tail end of the dissapaiting storm, winds reached speeds in the valley of +100km/h. We were starting to see the winds bend the giant eucalyptus trees back and forth, the winds shook the very roof of our new house making the support beams creek and moan like a old wooden navy vessel as it roared through the seas. Our little family, dogs and all hid in the bedroom as if were in a bunker waiting for the storm to pass. The Friday night was the worst experience for us. We heard a massive rip and crash in the early hours of the morning. Adam ran out into the cold, powerful winds with a flashlight to check on the horses. Donna and Sodwana were safe in the ope field sitting it out but to his surprise, the stable roof had ripped the roof screws and support beams clean off and was about to fly away with the wind! it was devastating. Adam raced to the stables without the thought of putting himself in danger, to save what roofing we had left. Ropes and rocks were thrown onto the sheets of roofing, anything to weigh them down or hold them tight so that we don’t left the material fly away. it was like we were living a nightmare or we were in a horror storm movie like twister or the end of the world. Luckily, this storm did pass and let a trail of destruction. Not only did we suffer damages but neighbours and folk in the town too suffered damages to roofing, wendy houses, milking sheds and more. it was one of the worst storms to hit the cape in a very long time. we were shocked and heartbroken to see our beloved stables broken and battered. We shed a lot of tears that day but this didn’t stop us from pulling up our socks and to start over again. this time we would reinforce the entire structure. Much to our surprise, we thought our little tack room would suffer a lot of damage as the materials as also timber, fire resistant fibre board and corrugated iron roofing but after inspecting it there was not a dent or scratch or anything wrong with it. The company and the men who put this little wendy together did a fantastic job. A true testament to their product and their workmanship. It turns out the builder we trusted didn’t really give us the strongest material to build with and roof structure wouldn’t have lasted long. This time, Adam dismissed the builder, hired the right builder and the stables were reinforced and constructed with heavy poles, timber, cement and thread rods that would be able to take a hammering from the elements. 1 week later the stables we back up in all its glory and looking much stronger and safer. Over time we have added beautiful sliding stable doors, rain tanks for water, a shelter for an additional two horses and much more. We are incredibly proud of our stables and have given the horses and us a place to rest, relax, groom and bond with our beloved equines. Older PostThe building phase starts at Ibalansi!